This is one of a pair hanging around the entrance to the mausoleum of Frank Woolworth and his family (including his troubled granddaughter and heiress Barbara Hutton, the "poor little rich girl"). 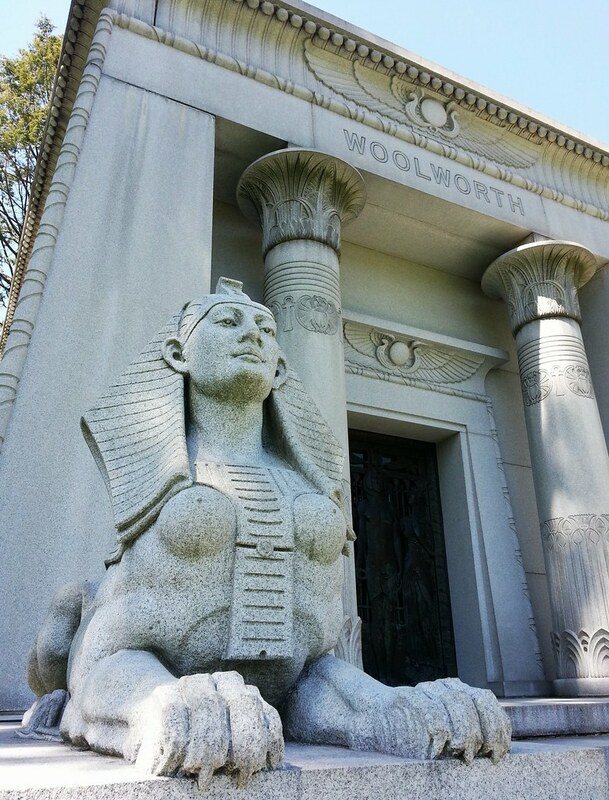 Mr. Woolworth, founder of the five-and-dime empire that bore his name, is one of several members of what Woodlawn calls its "Merchant Prince Hall of Fame"; James C. Penney and Rowland H. Macy, among others, can also be found resting peacefully here in the cemetery, Mr. Penney in a used (or "previously owned") mausoleum that he bought from William Randolph Hearst's widow. every Tuesday, Thursday and Sunday, both to care for the site and to spend time with the spirit of his dead wife. When the season calls for it, he decorates. Last Christmas, in addition to two ornamented trees, he installed a talking wreath on the door of the mausoleum, so that passers-by who triggered a motion detector were greeted with a hearty ''Merry Christmas.'' One security guard, on night patrol on the pitch-black grounds, was so startled he pulled out his gun. Daytime visitors were alternately spooked and delighted. There's a beautiful twist at the end of the NY Times's 2003 account of their relationship, from which I've quoted above. Take a read!